Go Maury, Go Maury, Go! Go! Go! 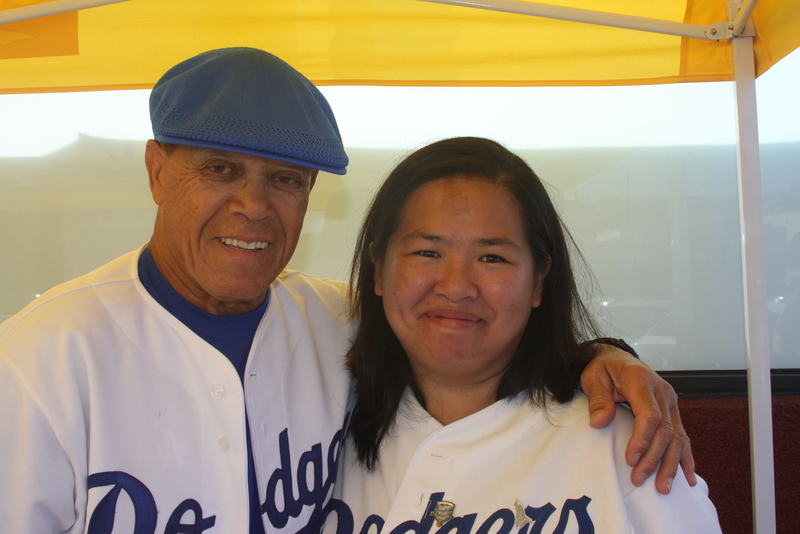 I only found out about the Maury Wills signing less than twelve hours before the event. At the time, I didn’t intend on going. Until my cousin, Jenny, called me at ten this morning. I had called her the night before about the event. She was on her way to the bus stop (she lives two blocks away from where the event was going to be) and told me she didn’t see anyone there. It was a little before ten I think and the event was supposed to start any minute. So, I called the Smart and Final Extra to verify about the signing. It was supposed to start any moment. So, I hopped in the shower and then got my things together for the signing. Jenny met me there and there were four or five other guys in line already. No one else was there really. Maury showed up and then more people starting looking to see what was going on. 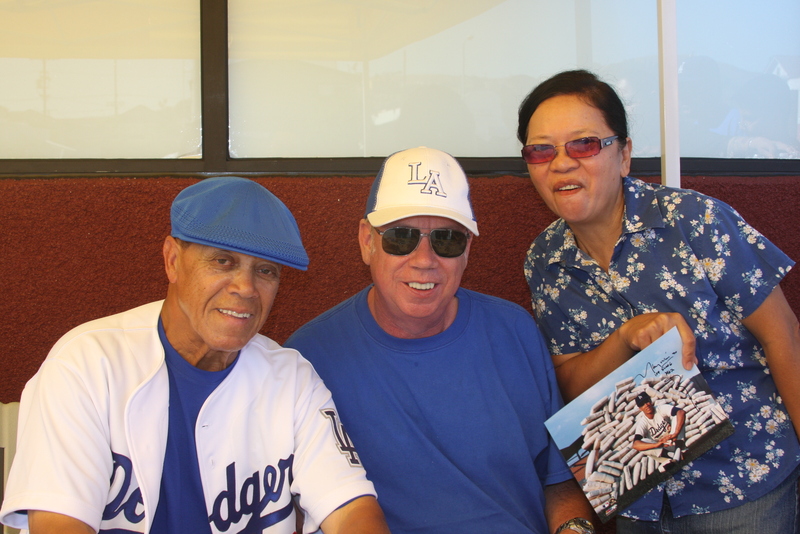 In fact, when one lady found out Maury Wills was signing autographs and they had 8x10s of him available for him to sign, she almost cut in front of us! Apparently, she didn’t see the line of six or seven (maybe more by then) people waiting for Maury Wills to sign their items. Maury signed my scrapbook from last year. I asked him to take a photo with me. He said, “sure, you want to come around the table?” I got next to him … and right before Jenny took the photo, he said, “let me fix your jersey.” I guess the top was open a little and he fixed it. Jenny actually got a photo of both him fixing my jersey and the photo of the two of us together. After the photo, he complimented the jersey, saying what a nice jersey it was. Then he asked me whose number was on the back. After that, it was Jenny’s turn. I gave her a picture of Maury Wills from the Dodgers/Phillies games earlier this year that honored him and he went out and “stole” second base. He looked at the picture and was trying to figure out what it was. Since Jenny was on her way to LACC when she came back for me, I said I’d take her. I took her to LACC, got Wendy’s, and then came back. I had texted Nina (and several others) about the event and Nina said her dad would have loved to meet him. I told her they should go! There wasn’t a lot of people there and they had 8x10s that they were giving away to get signed. So, they met me back there. There were about ten people in line. Nina came with her parents (Jack and Sol). Jack was hilarious! He told Maury that he watched Maury play for the Dodgers when Jack was in high school. Maury asked him, “was I good then?” Jack told him he was great. 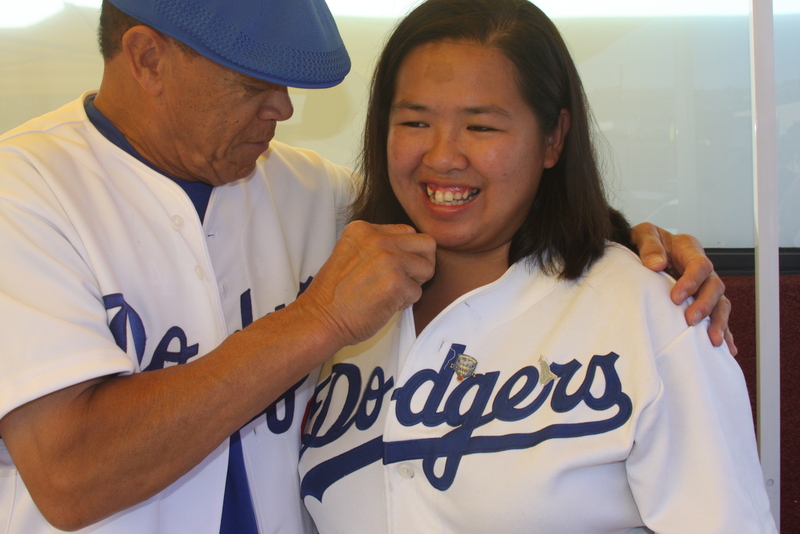 Then it was Sol’s turn and she was getting a photo signed for Jack’s cousin, who’s also a long-time Dodger fan. After that, Sol asked Jack if he wanted a photo with Maury. Maury told him to come around the table. Jack knelt down in front of it. Maury told him again to come around. Jack went around to the left of Maury, where there was guy sitting and he wasn’t going to get around that way. Maury told him to come the other way. Jack finally got next to Maury, and Sol got in the photo. I guess Nina had put down her photo right before her parents did the photo, because then it was her turn. Maury asked Nina who her favorite player is and she said Furcal. He commented that she was wearing his number. He asked her, “So what do you want from me? I’m not your favorite player?” It was so cute the way he was teasing her. She said she’d like his autograph and he asked her which picture. She pointed out the one she picked. He asked her if she wanted him to make it out to anyone special. She repied, “Me…” and he asked her for her name. She said “Catalina, like the island.” And he said, “that’s a nice name. I think I know how to spell it. Let me see what I should write…” He wrote different inscriptions on each of the three photos he signed for Nina’s family. He didn’t inscribe anything on my stuff. Maybe I should’ve asked. I really enjoyed this signing and I loved how Maury took his time with EACH fan and he talked to each of them and teased some. Just a great man!